Our stay at our “Hotel Victoria” got even better when the two Aussie lads (Cam and Matt) arrived. They are doing a similar trip to us, their boat is a 17 ft sail boat, open style with no cabin and they also have the ability to row. We were both aware of each other’s trips so it was really cool to actually meet out here. Sitting around swapping stories about our respective experiences over the past 6 weeks was brilliant and so interesting for us to hear how Matt and Cam’s trip has gone so far. 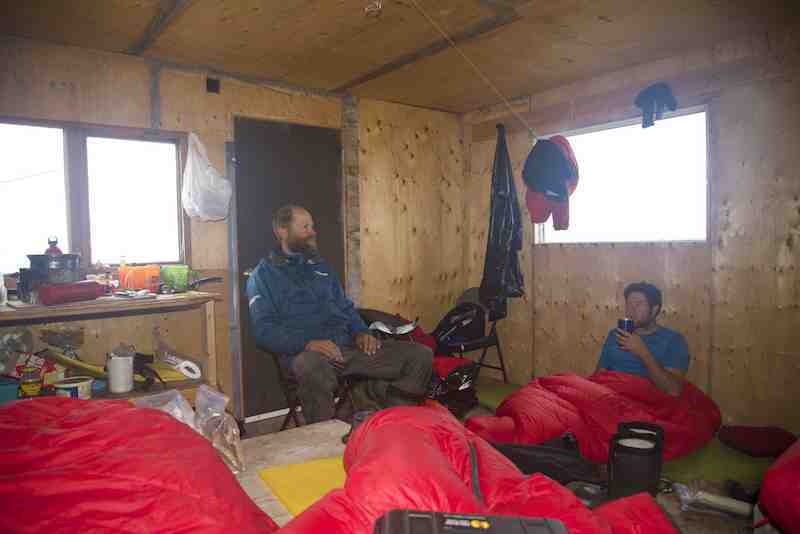 To be honest it was also somewhat refreshing to hear that they have found the trip as tough as we have. They were initially planning on trying to get to Resolute but are also finishing in Cambridge Bay for this year. Cam and Matt are two very experienced adventurers. Cam has kayak guided all over the world and has spent quite a bit of time both in the Arctic and Antarctica. 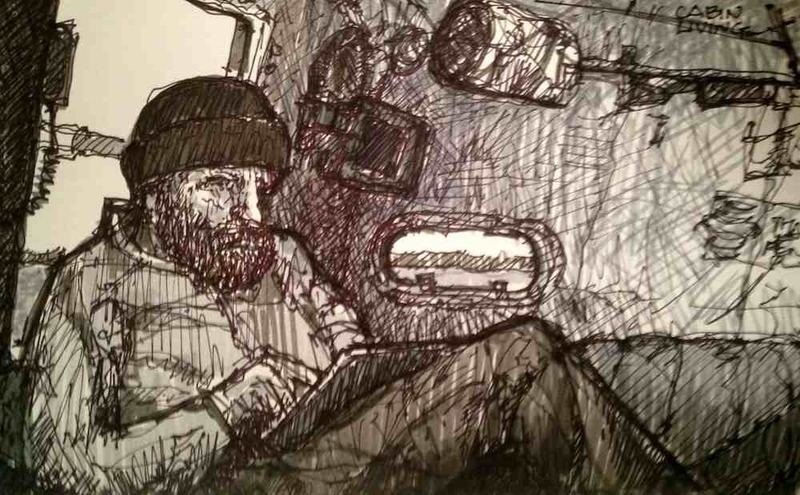 Matt has guided people multiple times to the North Pole and has also sailed in the Southern Ocean (coming very close to death on one occasion). Not only very experienced and interesting lads but also two very nice guys as well. Hopefully we will see them again in Cambridge Bay. We pushed off from Victoria Island early on Monday morning and we have had very favourable conditions since then. Although it was a bit choppy at times, the winds have been predominantly from the west and north west which means they are helping us along as we move east. 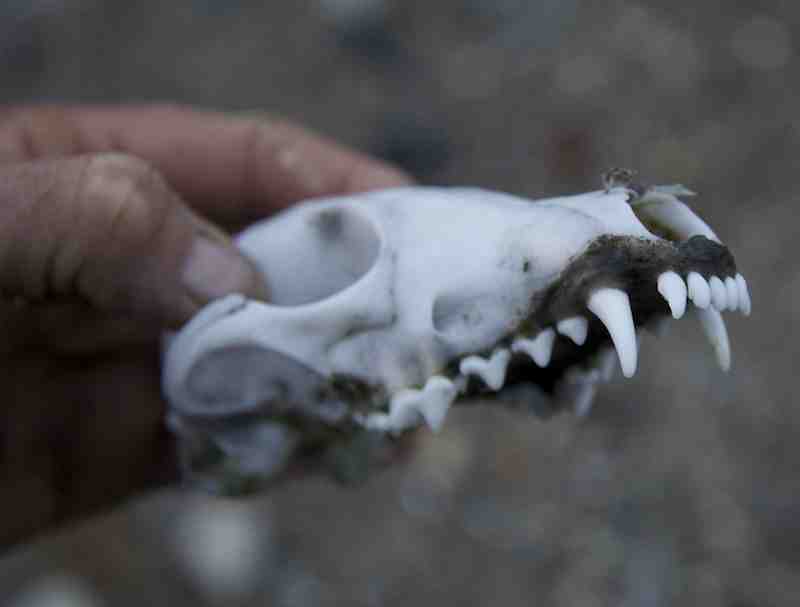 As I write this, we are about 250km from Cambridge Bay. It might not happen but if these conditions stayed with us for a few days, we could potentially reach CB by Sunday evening. If we get hit with less favourable weather conditions, then it will likely be next week before we finish. As usual, we can really just take it one day at a time but I’d be lying if I said I wasn’t a little bit optimistic that we could reach Cambridge Bay by the end of this week……. The past 48 hours have been great; we’ve had some calm weather that has helped us cover about 140km. These good conditions gave us an ideal window to cross over the Dolphin and Union Straight into the beginning of the Coronation Gulf. Our 22km crossing brought us to Lady Franklin Point which is another significant milestone for us because we have now reached Victoria Island. Cambridge Bay (which is on Victoria Island) is about 380km east of here so we now have somewhat of a straight shot to reach this community of about 1500 people. Lady Franklin was the widow of John Franklin whose infamous quest to find the North West Passage resulted in the death of his entire crew (129 people). An Irish man (Francis Crozier) on board Terror was Franklin’s second in command. Departing England in 1845, the two Franklin ships (Erebus and Terror) made a stop in Greenland before venturing further west into the unknown. This would prove to be the last time they were ever seen again by Europeans. The precise details of what happened to Franklin and his crew remain a mystery to this day and his name is synonymous with the history and folklore of the North West Passage. Between 1848 and 1859, more than 50 expeditions were mounted in an attempt to find the crew and quite a few of them were funded and put together by the indomitable Lady Jane Franklin. The wind was picking up last night as we arrived at the point so we decided to pull into a little cove beside an old decommissioned DEW (Defence Early Warning) Station. There was also a cabin near the waters edge and when we looked inside it we were absolutely delighted to see that is is still in use. Many of the hunting cabins we have stumbled upon so far are no longer in use and are effectively in tatters. However our little “Hotel Victoria” is perfectly in tact. It’s about 12 ft by 12ft in size, made of plywood and has a little counter on which to prepare food. It also has 2 wooden beds which are effectively planks of raised wood but throw a sleeping pad on top and we have some new found luxury. One of the beds is a double, the other a single and there is enough floor space to accommodate the 4th musketeer. This little shelter feels like an absolute palace, like our own little hotel in the middle of nowhere. There’s definitely a “self service” vibe to the place which is grand with us. 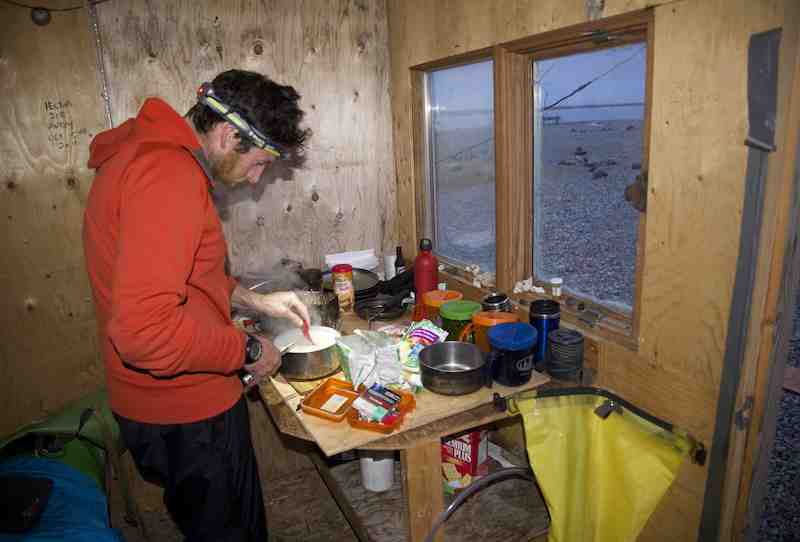 We were all starving after our crossing last night so we cooked up a big feed of pasta and spoiled ourselves by adding one sausage each into our bowls (only one more left now). Together with a hot coffee, this was absolute bliss. 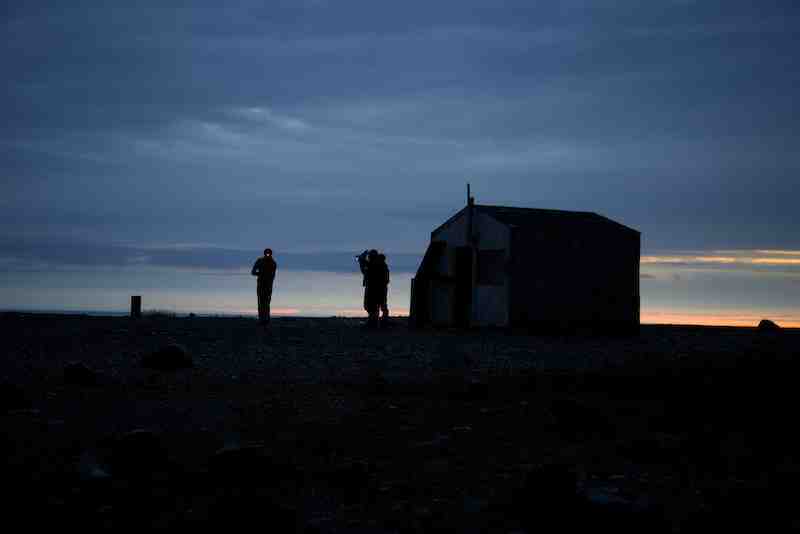 After seeing a few more Muskox roaming around nearby, we settled into our sleeping bags for the night. Unfortunately the wind had picked up which means we might be here for a day or so but to be honest, I don’t think any of us were all that bothered by this last night as we fell asleep in our luxurious new surroundings. When Sir John Franklin disappeared on his Northwest Passage quest, she would fund numerous expeditions to find him. Ultimately it would be one of her personally funded expeditions, not the British Navy’s, that discovered the truth of her husband’s faith. We’re currently moored at the tip of Cape Lady Franklin at the edge of the Coronation Gulf. It’s a milestone for us as we’ve left the mainland and are now on the shores of Victoria Island. An email greeted us this morning saying: “Congratulations on reaching Victoria Island. Austin Bay is always notorious for the bad currents and it is amazing you made it in the single shot. Lady Franklin Point and Becher Point are welcoming you.” I suppose lady luck really did follow us yesterday. Cape Lady Franklin is home to another decommissioned DEW Line station with it’s metal containers, domes and structures peering at us over the shoulder of gigantic man-made gravel ridge. We’re hunkered down in a small plywood clad shelter cabin that serves as a hunting cabin at times of the year. Muskox, caribou and fox skeletons are scattered among the rocks as is various drying racks and tools used in the post hunt process. The cabin is the perfect respite for us after several days of non-stop rowing. It’s a guilt-free pleasure as unfavourable winds are blowing outside. Spartan by normal standards this little 12ft x 12ft box is a 5-star hotel for us. Plywood bunks and cooking counter round out the interior – everything we need. 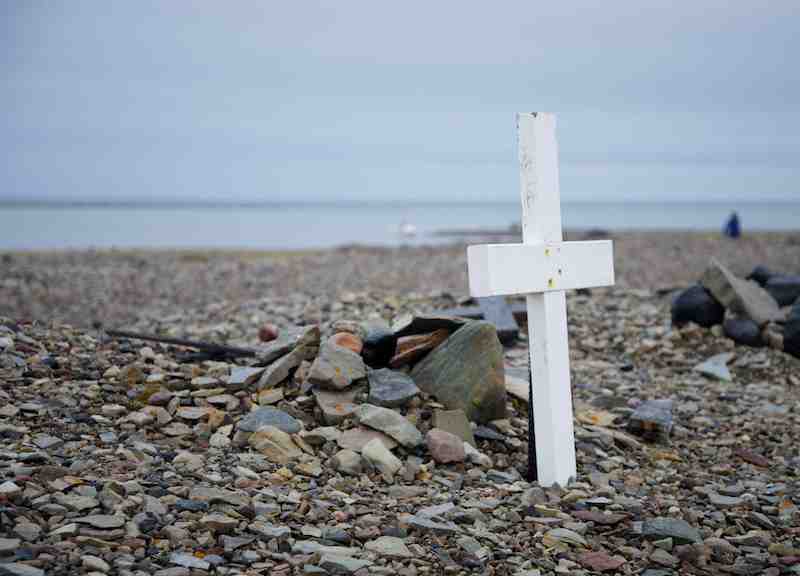 Catching our eye, a short distance from the cabin, are seven white crosses in the gravel. It’s an unexpected sight in such a lonely outpost but this appears to be a cemetery of sorts, a bulging roll in the gravel in front of each cross speaking to something beneath. The wood crosses appear new and seem to replace older ones that lie close by. There’s the remains of a cross of flowers blown some distance away, a few flowers still holding shape and colour. We’re hundreds of kilometres from any community and there’s no markings on the crosses. I can’t but help wonder who these people were and why they’re here. The last two and a half days have seen us rowing non-stop. Except for some short breaks to wait out a change in the current we’ve been doing our 3-hour shifts essentially uninterrupted. This has been an unexpected surprise for us as the forecast has not been optimistic for this period. The crossing from the mainland to Victoria Island is a hurdle we’ve been anticipating for some time. We make our traverse at the narrowing of the Dolphin and Union Strait where it feeds into the Coronation Gulf and use Lambert and Camping Islands as stepping stones of sorts, as points of protection for us if inclement weather roles in. With the narrowing of any large body of water there’s always the concern of increased currents and ocean anomalies that we’ve experienced rounding some of the larger capes. In many ways we’re a cork in these waters going where the wind and currents take us. It’s an unnerving reality – certainly when making larger crossings – and one we’ve come to live with. We counter this actuality by anchoring when we can or by anticipating where we’d be pushed if we can’t. Weeks ago when rounding Cape Parry we were being blown towards a 5+ ice pack (50% ice cover and no place for any boat other than an ice breaker) in the middle of Darnley Bay. Had it not been for our fortuitous landing on Bear Island we would have been cast into a heaving mass of ice akin to a thousand steel shipping containers grinding together in the midst of a gale. It was a sobering moment that has us anticipating worst case scenarios a lot closer now. On our crossing of Dolphin and Union Strait we cut the corner from Camping Island to Victoria Island, heading straight across Austin Bay to Cape Lady Franklin. The exposure to weather is more committing on this line but the saving in distance and time is impossible to resist. The weather only deteriorates in the final minutes of the crossing and we pull into another DEW Line station at the tip of Cape Lady Franklin. 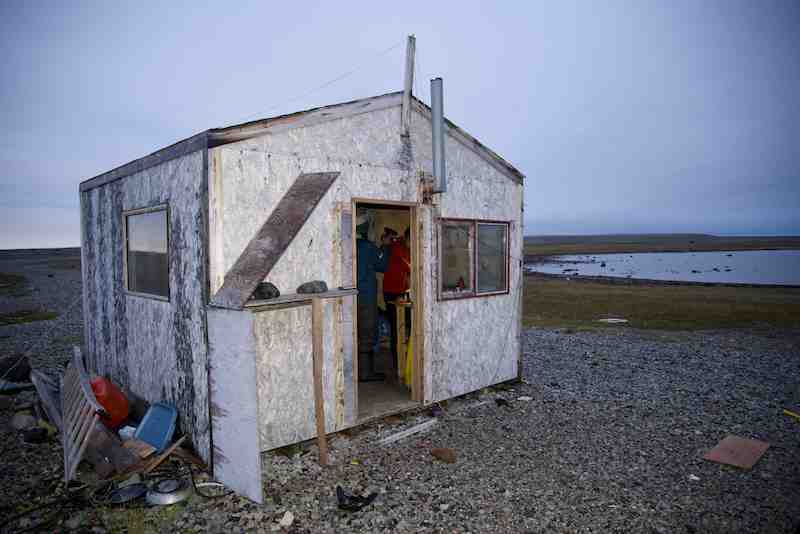 There’s a small shelter cabin on shore and the prospect of a night in something other than our boat or tent has us giddy with anticipation. As the winds build and the skies darken, we unload The Arctic Joule and make our way to our evening shelter. We’ve finally have a little lady luck on our side, a little Lady Franklin luck. We direct The Arctic Joule towards shore and start moving as smoothly and quietly as we can as not to spook the muskox. He spots us of course, how couldn’t he, and scampers off over the rise. There’s little doubt this one’s a lone bull, drifting solo in summer months, who’ll eventually find a herd to travel with in winter. We beach the boat and walk inland in hope of catching a glimpse of this fellow. He seems to have disappeared altogether but Frank spots him in repose over a small rise. Like hunters we move in quietly to get off a clean shot but instead of rifles we carry a Nikon D600 and a Canon HV30. The muskox rises to its feet when we’re a couple hundred feet away. His head is high and he’s agitated. Frank keeps moving forward to within 100ft, drops to a knee and starts filming. Our bull ramps up his threat display by lowering his head and rubbing the inside of his foreleg against a pear shaped gland below his eye. This is unique to muskoxen and is called “whetting of the horns.” If he starts to tilt his head in a provocative manner or rake his horns against the ground we might be running for cover. 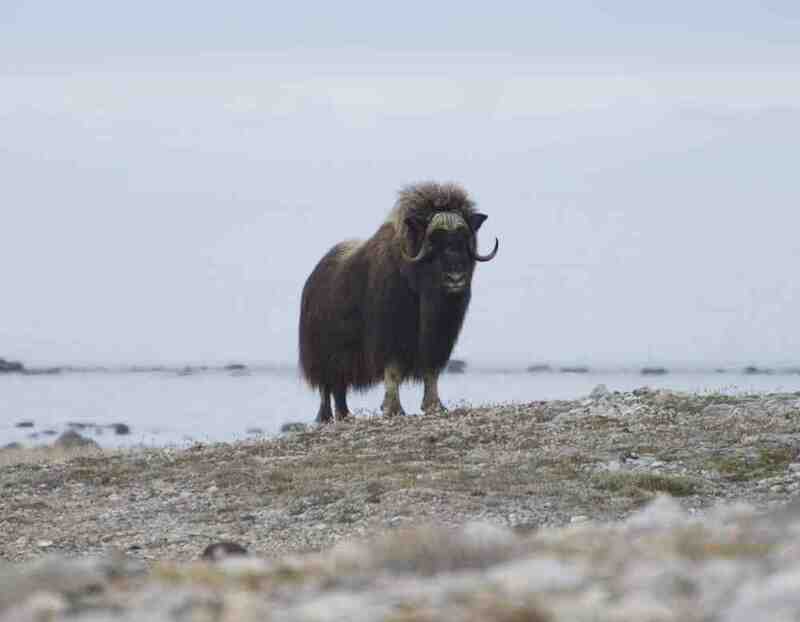 A muskox is a wild looking creature. A frontal gown of long guard hair give the muskox a striking presence, a creature on the fringe, a barren land shaman, an arctic pirate. If Keith Richard’s passes on I could see him coming back as a muskox. Although it looks to be of the bison family the muskox traces its ancestry to the sheep/goat family. It’s only living relative is the taking of northern Tibet. The inuit call the muskox oomingmaq, meaning “animal with skin like beard”. We have something similar on our team: it’s Frank, “man with face like beard”, his facial guard hair equally extraordinary. Our presence finally gets to much for Murray. (We had him named within minutes of sighting him) Murray the Muskox slowly turns away from us and then explodes into a run. He disappears over a rocky ridge left again to his lonely walkings. 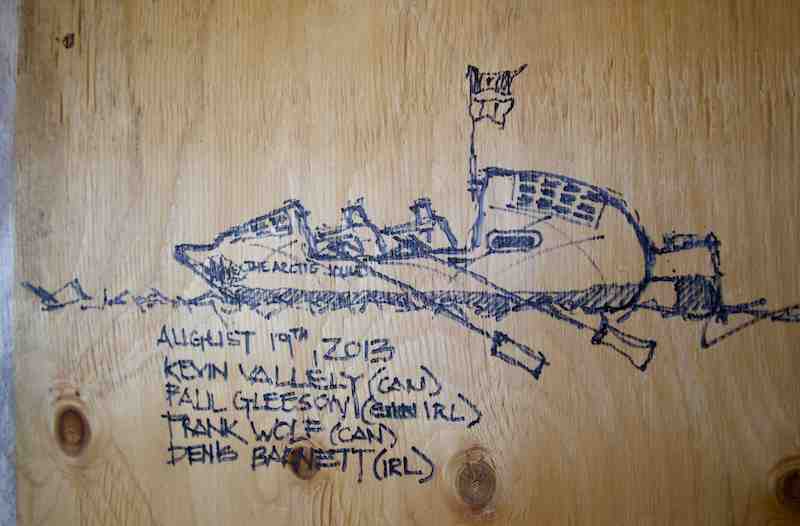 One of the challenges travelling the Northwest Passage is anticipating the play of currents on our movement. The difference between a current with us and against us is the difference between easy rowing and none at all. We are told that the general background current in this section of the Northwest Passage is from west to east but we’ve come to learn that site specific factors of tide and wind play are far more important in its prediction. We’ve found that wind and tide have a profound influence on current throughout the passage, it’s not only limited to Cape Bathurst. The ebb and flow of tidal movement mixed with the push from wind makes the predictability of current something more akin to sooth-saying than it is to critical analysis. We find ourselves continually fooled by what we think should be the correct direction but isn’t.